“Every success story is a tale of constant adaption, revision and change.” – Richard Branson, billionaire and founder of Virgin Group. Alicia Iriberri and Gondy Leroy of Claremont Graduate University surveyed over 1000 publications across multiple disciplines including computer science, information systems, sociology, and management in their seminal 2009 research paper “A Life-Cycle Perspective on Online Community Success.” Their research forms the foundation for most modern community management, and in their paper they write, “The impact each design component has on the success of the online community shifts depending on which life-cycle stage the online community is experiencing.” The right strategy at the right time will maximize the impact. Every community goes through a community lifecycle of four stages: Inception, Growth, Maturity, and Mitosis. Architecting a community is very different for the first ten users versus the next thousand users. New priorities come into play, community concerns will shift and strategies need tochange. As a community manager, ensure the strategy is appropriate and reflects your community lifecycle to ensure maximum impact. Let’s take a look at proper goal settings for each stage of the community lifecycle. Members: Focus on nurturing a core team of members. Your goal is to get 10 – 12 superusers to consistently engage and support the community vision. Promotion: Your community won’t contain enough content to attract visitors through search engines, so you’ll have to rely on personal referrals, word-of-mouth, and direct acquaintances. Content: Focus on building expertise on core content areas that will make you stand out. You want to be the best in one subject. You’ll need to generate much of the content programming yourself, which should focus on functional value. Community: The community is heavily centered around the community founder at this stage, so set the right tone and lead through example. Growth is where the magic of community happens, balanced against the development of more explicit and formal conduct. Members: Shift your focus from nurturing individual users to creating a workflow that can systematically welcome new members. Promotion: You should be proactive with your self-promotional activities to build community awareness such as email marketing, social media, or mailing lists. Content: Content will now be a mix between self-generated and co-created. You want to highlight community content by others to encourage community expertise. When you create content yourself, you want to start including emotionally-driven questions that connect users. Organization: Measure specific metrics for organization goals, highlight community health and successes, secure funding for ongoing budget and team. Community: A unique sense of community is cultivated at this time with shared experiences and language between members. Members feel excited to be a part of your community’s growth. Members: There should be a clearly defined process and welcome guide for onboarding new members, an established pipeline that constantly brings on new superusers, and a rewards program that recognizes members for different types of member journeys. Promotion: Your site is well-known, so the search engine traffic and content within your community is enough to bring in new users. You can optimize your SEO at this point. Content: Almost all content is user-created at this point, which means your focus needs to shift to content recognition, organization, and moderation. Highlight the best community content; categorize and properly tag new content so the community stays organized; and scale your moderation to handle the size of your community. Organization: The community is a key part of your organization’s larger success and supports multiple areas of the business. Be a strong internal advocate for the community and align your community with your organization’s new profit areas. Community: Superusers not only have the privilege of creating their own content for the community, but they’ve stepped up as mentors and moderators. Your community has a strong culture that’s reinforced by members. Mitosis is the stage when your Invision Community grows beyond its original mission, potentially splitting off into new subgroups. Many communities stagnate at this point with falling engagement and plateauing registration, but you’re catching onto the next big trend in your industry to grow into. Members: New member registrations flatlines because you’re tracking with the industry. Your goal is to continue to delight members with new forms of omnichannel engagement like regional meetups, video conferencing, and headline conferences. Promotion: Your community self-generates organic traffic. Your promotion should shift from trying to advertise for yourself to exerting influence with industry partners as a trusted leader in the field. Content: Members can find the most comprehensive set of resource documents and discussion on your community. Your goal is to distill the knowledge into the best tips and guides for newcomers to obtain the most accurate information as quickly as possible. You should also archive areas that no longer receive activity while finding growth topics in your field. Organization: The community is a critical part of all business operations and integrates into all relevant workflows. 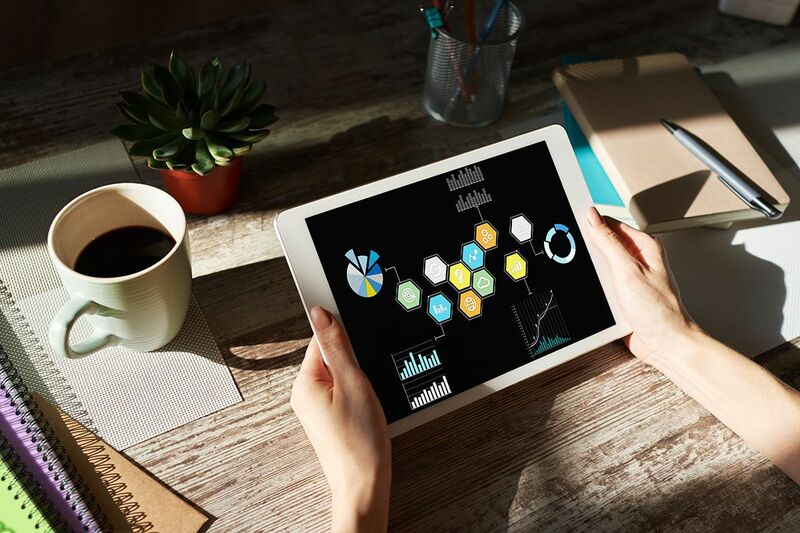 You should build custom metrics to measure results, help determine new investment decisions, and streamline business efficiencies at the organizational level that benefit the community. Community: Your community becomes an incubator of new sections in a controlled manner for potential spin-off. Superusers control and moderate their own areas of the site like Clubs or Blogs. 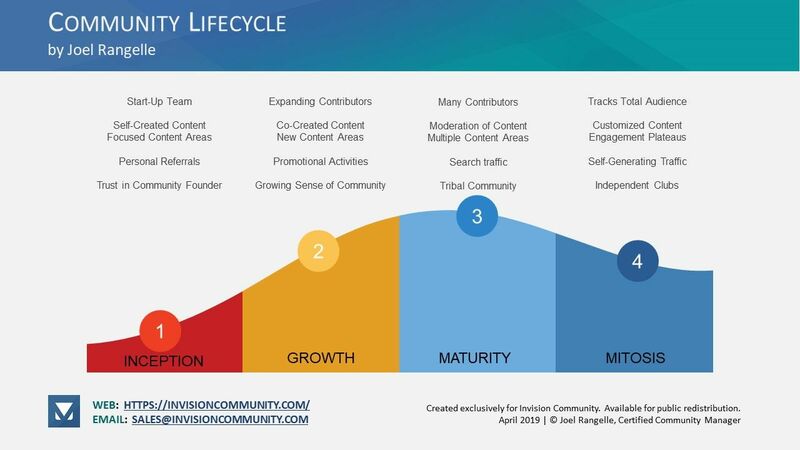 Online communities evolve through distinct stages of the community lifecycle. At each stage, the needs and activities of members require different tools, features, and community management. Certain strategies are more impactful when they coincide with the right sequence. Invision Community makes it easy to get started with a technology platform packed with features that every community manager can start using right away. But how you get to the first ten users, to the first thousand posts, or even to one billion likes will be a journey that’s truly your own. Share your success story of Invision Community in the comments below. Did you make any rookie mistakes that you wish you knew beforehand? What are some strategies that you’re pursuing right now, and why do you think it’s an impactful decision for this stage of your community’s lifecycle? We’d love to hear your journey along the community lifecycle.